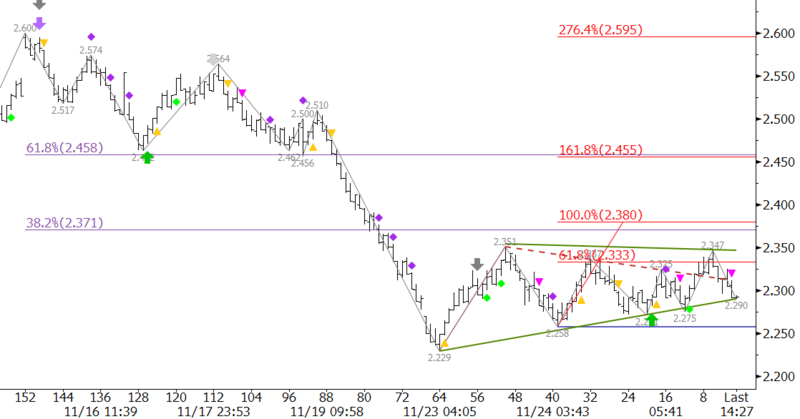 Natural gas’s upward correction has been held at bay as the market seeks frigid temperatures to support a move higher. January is settling into the familiar range between approximately $2.26 and $2.39 that December oscillated in before it finally broke lower. This is likely where prices will remain for the rest of the week due to the Thanksgiving holiday. The move up is corrective, and that point was verified on Wednesday when prices initially broke higher out of an intraday coil and subsequently stalled at $2.347 before overcoming the $2.351 swing high. Meeting the 0.618 projection for the wave $2.229 – 2.351 – 2.258 indicates January could still test $2.39, which is near the 1.00 projection and the 38 percent retracement of the decline from $2.60 to $2.229, as long as the $2.258 swing low holds. However, without support from external factors (cold temperatures) the market will be hard pressed to rise above $2.39 and extend to the next confluence point of $2.48. Odds favor the decline and a test of $2.26 by the end of this week. This is a tough call right now because the market is sitting on major support, and external factors could turn this market higher in a heartbeat. Therefore, provided $2.26 can hold, there is still a reasonable chance the upward correction will extend to $2.39, but at this point we would not hold our breath. This is a brief natural gas forecast for the next day or so. Our weekly Natural Gas Commentary is a much more detailed and thorough analysis. If you are interested in learning more, please sign up for a complimentary four week trial.